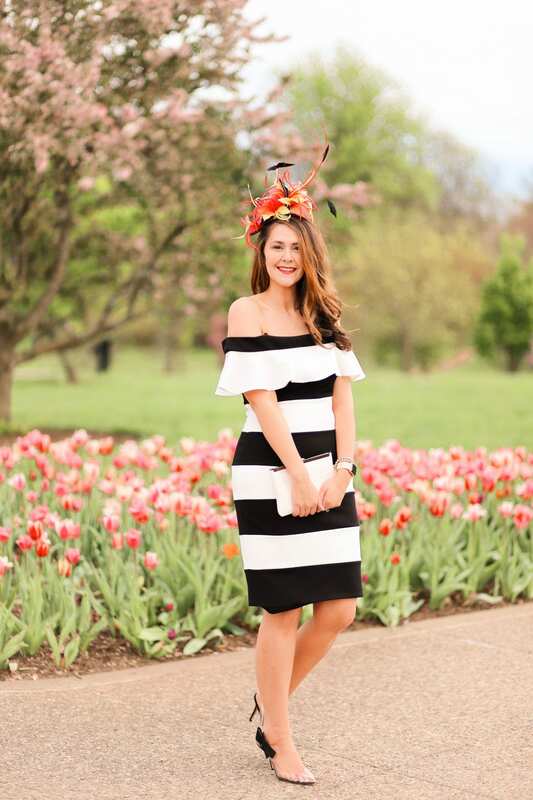 The Kentucky Derby is one of the most fashionable events of the spring. I always love seeing the outfits that everyone has put together, and I especially love seeing the hats and fascinators. 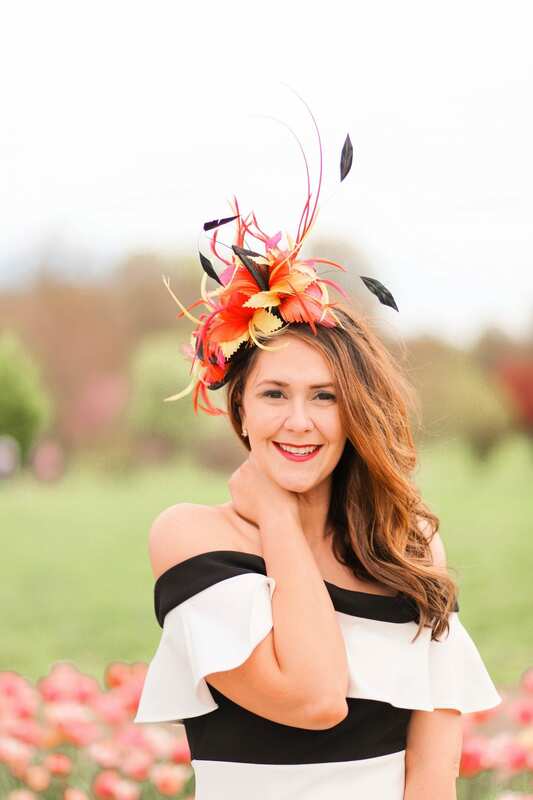 Because when it comes to Derby, it’s all about the hats! 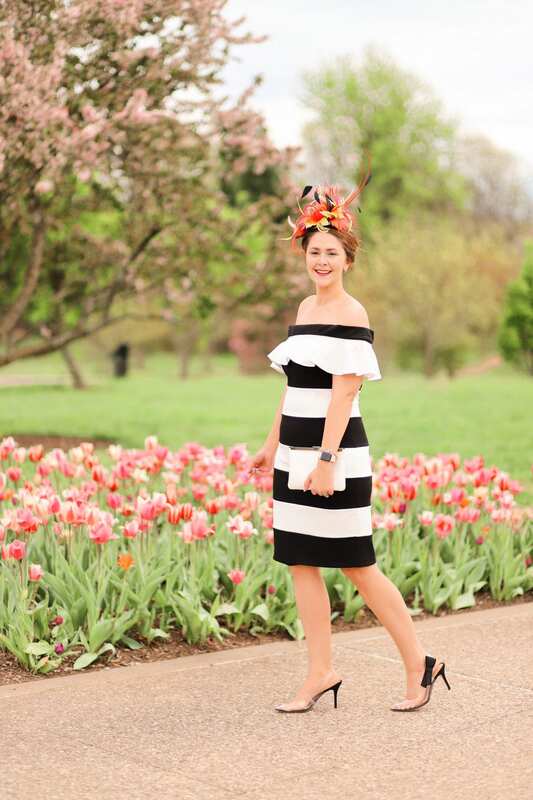 I’ve teamed up with Macy’s to bring you three amazing Kentucky Derby looks to help inspire your Derby fashion (they also work for Easter, Keenland, or a royal wedding.haha). 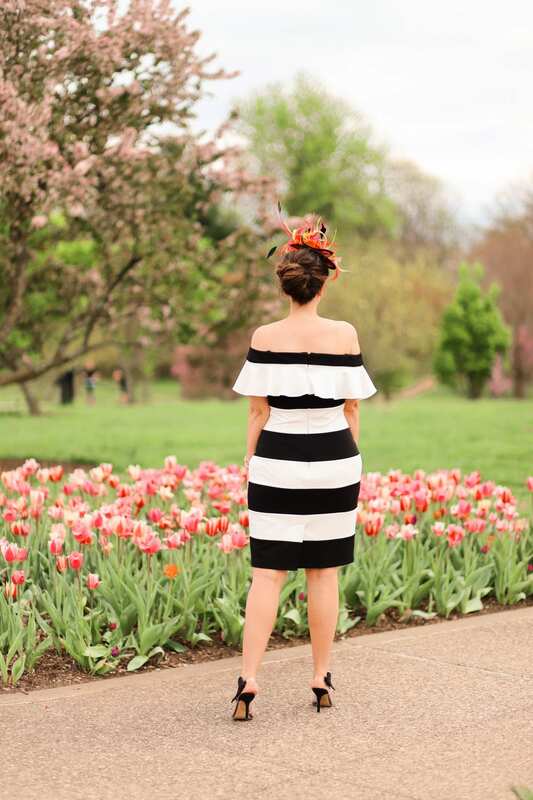 We’re kicking this Kentucky Derby fashion series off today with a trendy Derby look, featuring this spring’s hottest shoe trend! I headed straight to Macy’s Oxmoor in Louisville to do my Derby shopping. They have an amazing selection of dresses, shoes, and Derby hats to make your Derby look stand out. And they also have personal shoppers available to help you put together amazing outfits. Be sure to ask for Courtney, who helped me narrow down my choices because they have too many great pieces! This dress was love at first site. 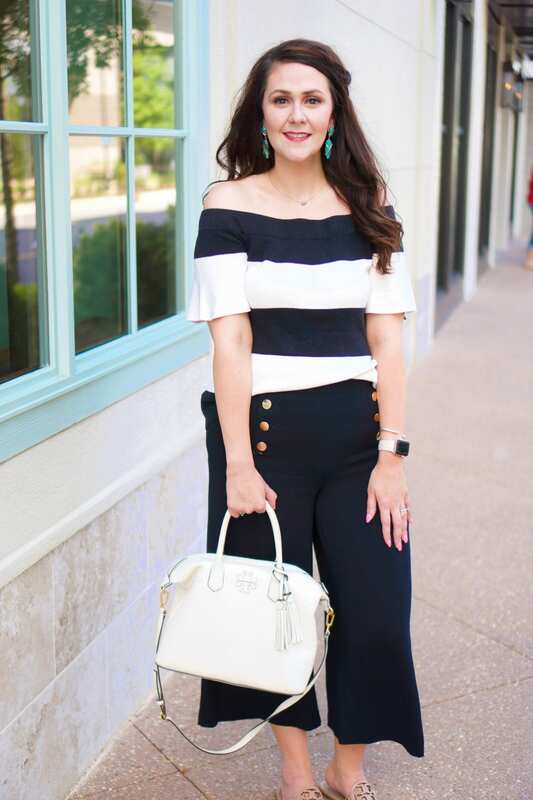 The bold black and white pattern is sure to stand out in a sea of light colors at the races. When I tried it on, I really liked the fit of the dress (it’s TTS) and how easily the fabric stretches and moves. The off-the-should neckline with ruffle give a very on-trend spin to a classic color pattern. I think every event outfit needs a conversation piece, and this outfit’s conversation piece is differently my bright feathered fascinator. Fascinators are more trendy than hats, and in my opinion, they should be fun and just a little over-the-top. This headpiece for Derby makes the outfit! While the dress is stunning, it’s neutral color scheme really lets this fascinator shine and take centerstage. The biggest shoe trend for spring is clear heels! Yes, shoes are baring it all and going see-through for spring. These heels make me feel like Cinderella. The black bow on the side is such a chic touch, and ties the heels into the rest of the outfit without drawing your attention away from the fascinator and dress. And I know these are heels, but man are they comfortable! I found them easy to walk in, and the material is not stiff like I expected it to be. Make sure to size up a 1/2 size though, as you definitely don’t want to show off scrunched toes. Now, later this week, I’ll be switching things up and bringing you a completely different Derby look featuring another of this season’s hottest trends, lace. 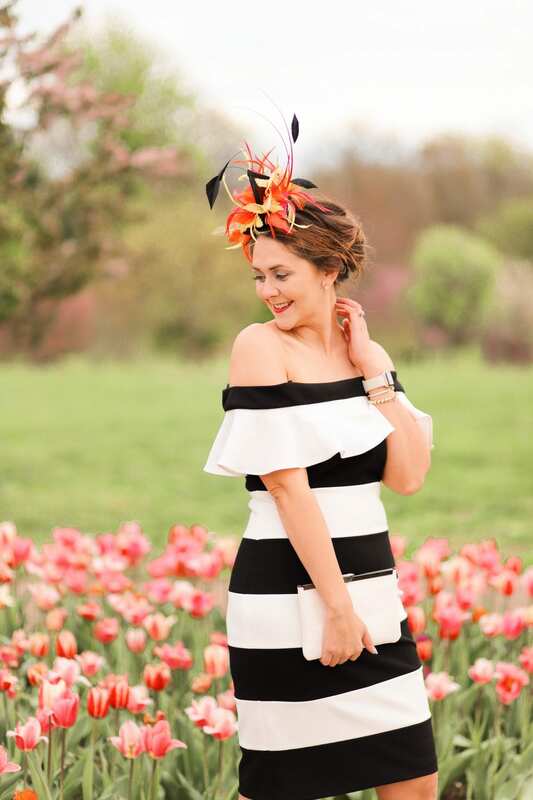 If you’re looking for even more Kentucky Derby fashion inspiration, Macy’s is hosting a Get Ready for the Races with Macy’s event this Saturday at their Oxmoor location, where What Nicole Wore, Authentically Emmie, the Kentucky Gent, and Her Kentucky will be sharing hot Derby trends and hosting tips!